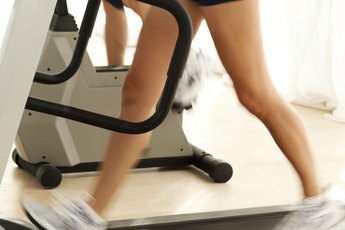 The treadmill is a safe way to attack the fat on your midsection. Spot reducing fat, from your stomach or elsewhere, isn't possible. But the right treadmill routine might help you lose an impressive amount of total body fat. Registered dietitian Dr. Chris Mohr says in Bodybuilding.com that a high intensity workout with sprinting can burn up to 600 calories in just 20 minutes. 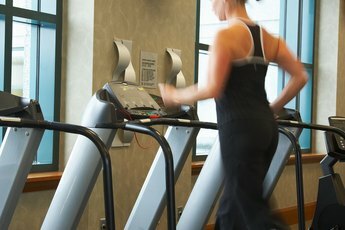 A treadmill routine that can be adapted for a beginner is the safest way to get started on your fat-loss journey. Interval training routines work for beginners and can be adapted as exercisers become more fit. Intervals are repeated periods of hard work combined with active rest, such as slower walking. Intervals have four components -- time, work intensity, rest and repetitions -- according to personal trainer Dr. Jason Kemp in an article for IDEA. 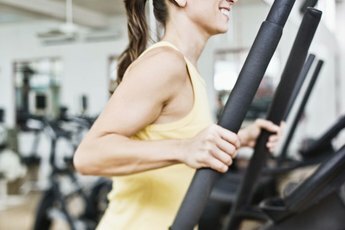 Intervals not only burn a lot of calories during the exercise, they increase your metabolism to continue burning calories afterward, explains coach and registered diettian Dr. John Berardi on Bodybuilding.com. Two routines that will get great results are flat treadmill intervals and incline treadmill intervals. To get started doing intervals on a flat treadmill, set the treadmill to a pace that is a comfortable walk and use this for your recovery speed. Then set the speed to something that would be difficult to maintain for three minutes. This may be a fast jog for some and a power walk for others. After the three minutes, use the next three minutes to walk and recover, then repeat. Do this for three to five repetitions the first time and then boost the difficulty as your fitness improves. For a beginner, a fast walk can be good enough to get started losing fat. Doing your workouts on an incline can actually be safer than doing them on a flat treadmill. In a Bodybuilding.com article, strength and conditioning coach Charles Staley said that the difficulty of the incline means you won't be able to run as fast, which make it less likely that you'll pull a muscle. To get started, set the treadmill at a comfortable incline and set the speed to something that you can walk comfortably. Step on to the treadmill and crank up the speed. Make it fast enough to make it difficult to maintain one minute of work. After the minute is over, walk for two minutes. Repeat this for five to six repetitions and then add more incline and speed as you get better at doing them. Consult your doctor before beginning any exercise program. Start your intervals at a pace that's slower than you think is necessary, so that you don't overdo it. Drink water before and during the intervals to prevent dehydration and do a thorough warmup before beginning. When you finish your intervals, do some walking to lower your heart rate and stretch your lower body.